Jim Jeffcoat played 15 seasons in the NFL after being drafted in the first round by the Dallas Cowboys out of Arizona State in 1983. He’d immediately replace Harvey Martin in the lineup and Jeffcoat would pick up where Martin left off, -harassing opposing ball carriers and quarterbacks of the NFC East opposite “Too Tall” Jones. Over 12 seasons with the Cowboys, Jeffcoat became recognized as one of the best finess rushers in the league recording 5 seasons of 10 or more sacks and 5 seasons of 70+ tackles. 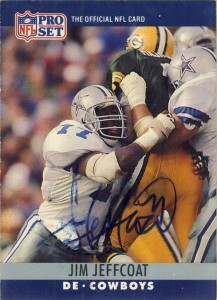 As time wore on, and with the eventual arrival of Charles Haley, Jim would share time at left defensive end with Tony Tolbert. He’d oddly sign with the Buffalo Bills in 1995, playing 3 more seasons with them before his eventual retirement, after 15 seasons. Jim’s 102.5 sacks rank him in the career top 25 for the NFL, and while he was nominated in 2008, Jeffcoat has not made the Pro Football Hall of Fame. Considered one of the finest defensive linemen to come out of Arizona State, he was inducted into their hall of fame in 1994. Since retirement Jeffcoat has worked for the Dallas Cowboys and Houston Cougars as a defensive line coach and at the time of this post he was working for the San Jose State Spartans in that same capacity.